Growers return to the basics to fortify their tactics against herbicide-resistant weeds. Editor's Note: This is the final story in the Tackle Resistance series to help farmers better understand how to manage herbicide resistance. During a typical growing season, cropland around central Illinois can offer up stark contrasts in weed control. On one side of the blacktop, a soybean field can be so overrun with herbicide- resistant waterhemp, it's hard to see the crop. Directly across the road, soybeans can be clean as a whistle. Weed scientists at the University of Illinois who made daily jaunts down these roads wondered what was causing these big gaps in weed control. Their curiosity evolved into a far-reaching study of landscape, soil, weed and farm-management data from 105 central-Illinois grain farms, including almost 500 site years of herbicide application records, collected between 2004 and 2010. In addition to these tried and true methods, another non-herbicide control option that's gaining attention is managing harvest weed seed. This takes a much more direct approach to handling a resistant weed by never letting it become one in the first place. Harvest weed seed control practices employ modifications to the combine to help destroy (grinding up) weed seed and thus prevent them from entering the soil seedbank. These and other tactics are being evaluated by growers in their on-going battle with herbicide resistance. Weed scientists say when combined with an in-season herbicide program using overlapping residual herbicides and multiple effective modes of action with every application–where possible, they can help farmers manage weeds more effectively. In turn, growers will begin to reduce the number of resistant weeds emerging before, during and after the growing season. The researchers found that herbicide management practices were the most important factor in the development of resistance in those fields. According to weed scientist Aaron Hager, a coauthor of the study, the occurrence of glyphosate-resistant waterhemp was greatest in fields where glyphosate had been used in over 75% of the seasons included in the analysis, where fewer modes of action were used each year, and where herbicide rotation occurred annually. Furthermore, the differences between waterhemp-infested and clean fields came down to a single management practice. The best predictor of whether glyphosate resistance was in a field had to do with whether a farmer used overlapping effective modes of action, Hager says. "It could be using tank mixes or premixes, but the key is that you have to have at least two herbicides that are effective." Unfortunately, always applying two effective modes of action has become a lot more challenging with the development of highly competitive weeds resistant to multiple groups of herbicides. "To explain what we've found about always using two effective modes of action is easy," Hager says. "To actually implement it is not. If you have glyphosate-resistant soybeans, your options for postemergence control are glyphosate, PPO inhibitors and ALS inhibitors. ALS inhibitors are functionally eliminated because of how pervasive resistance is. If your weeds are also resistant to glyphosate, all you're left with is PPOs." At the same time, many producers are learning or relearning the nuances of tank mixing, says Purdue University weed scientist Bill Johnson. "Prior to glyphosate-tolerant crops, producers did a great job of weed control and resistance management because they were using narrow spectrum herbicides, and they had to tank mix more. 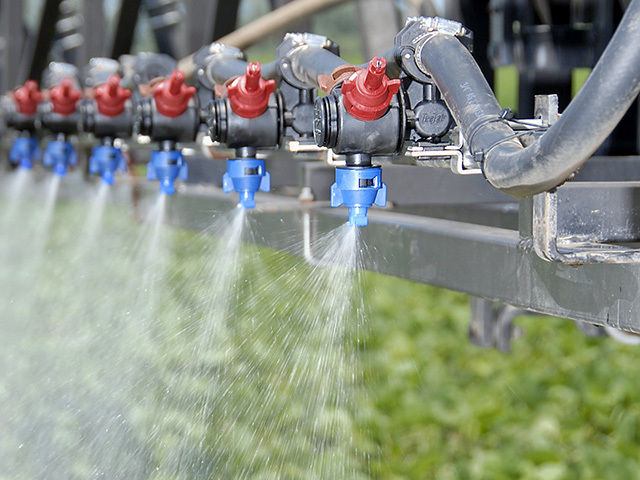 Today, we have a generation of farmers who are having to get back to the basics of how herbicides work–things like mixing order and what adjuvants to put in the tank."